Taken on our farm , I was on ground with homemade ghillie, bow designed and built in my shop. 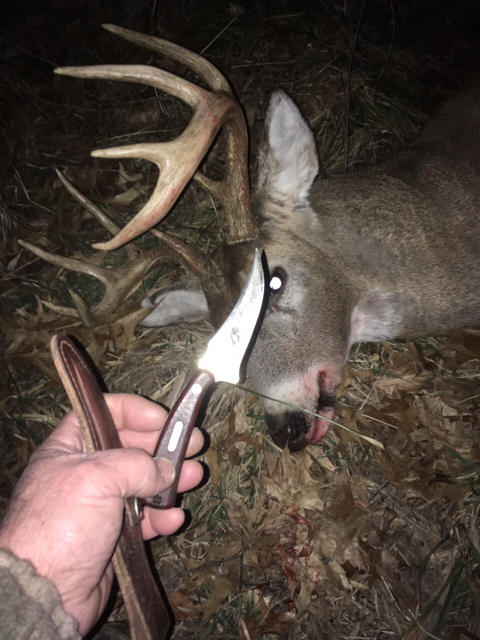 Brother John field dressed ( we do each other’s bucks) with Dad’s knife. Life is great!! Well, those pics are better but not great!! Alright, I better get this typed, so I can go hunt this afternoon, got about 4 tags left! So, I have an acre of beans on the back of my place which is in CRP , I don't hunt the field, but the entries to it . Hate to bump deer when I leave. SW wind last nite, and not much other palce to be, we moved a stand where I sit with SW wind yesterday morn and I wanted to let it rest. So I put on my el cheapo homemade ghillie which constist of a leafy mesh bug jacket that I put streamers of camo mesh about a half inch wide on. Just poked them in and tied a knot to keep them. Took my chair which I had modified with some 4" dia feet of plywood to keep it from sinking in soft ground(ya sensing a modification pattern here?) and set up in the fencerow by a gate onto the neighbors cut beans. Very quiet til 20 minutes from dark, when 3 big does hopped the fence 50 yards N of me and eased out in the beans, I could hear them ripping the pods off the stalks! Figured that was gonna be it when lo and behold antlers from the other side of gateway!! The green shoot light came on instantly seeing that I hadn't killed a buck on my place and he looked pretty good. There was a triple locust tree beside the gate so I drew when he went behind it to come thru gate, and when he cleared the brambles and tall grass, I gave a tiny bleat. He paused and the arrow was gone, heard it smack hard and he tore straight ahead . The shaft rattled on the grass and small trees, so I knew it wasn't a pass thru. He went under a huge pin oak with low hanging limbs and a huge crash then silence. I texted my bro and my wife and sat there for 15 minutes. I thought I heard a big exhale like the last air going out. Then left all my gear and sneaked out back to the truck. I didn't go look at shot location because it was in view of the big tree and my hide wasn't so I just left. Gave him an hour, that is a damn long time if you ask me!! We drove up with nothing happening, stepped out of truck , bro turned on light ans said" right there he is" Man, what a relief, you know how you second guess what you saw and heard? Praise the Lord!! The shot looked very low when we walked up , I said " a couple inches lower and we would be looking for him awhile" He had blood on mouth and nose so I knew it got lung somehow. When field dressing it got lung and heart and the arrow angled up quite a bit, I'll have to look at my hide again cause I didn't think I was much lower than where he was. John field dressed him as we do each other's bow bucks. The knife was one I gave my Dad 30 years ago, a Schrade Sharpfinger, and he had it very sharp. 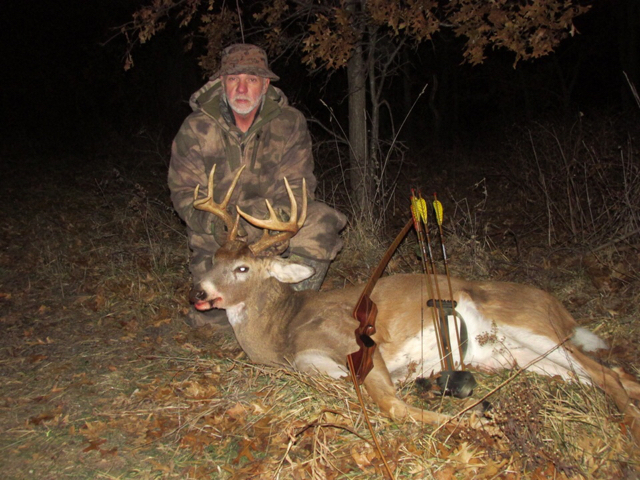 He weighed in at 170# field dressed, took him with the same bow as last year, a 64" TD pulling 48# @ my 28" draw. Thanks for going along with me!! 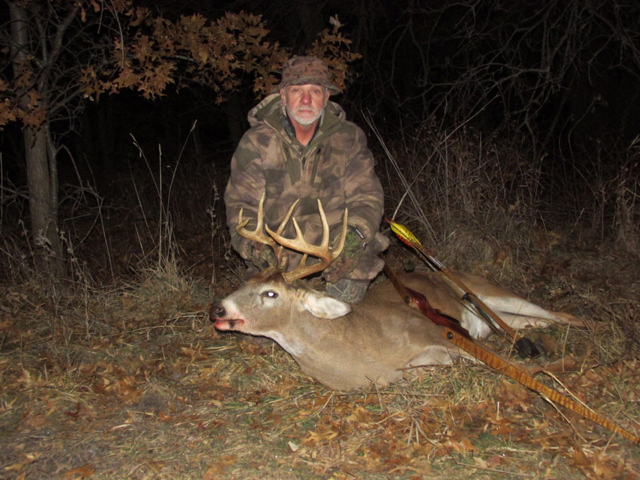 Congrats Kenny, Nice Buck!,,,nothing like hunting them from the ground with a ghillie of any make. Thanks guys!! Missed seeing you this year Craig!! Way to get it done, Kenny!!! !